Ask any family why they chose to put down roots in this Atlanta suburb and you'll get three answers. First, the expected: an excellent school system and low crime (the low�est rate of any small town in the state). Then the unexpect�ed: the golf carts. 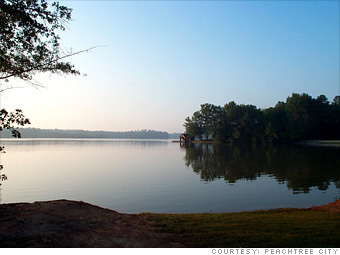 Planned in 1959, Peachtree City contains five "villages" that are connected not only by standard roads but also by 90 miles of wooded golf-cart paths. Children drive carts to school, families to either of two 250-acre lakes, and yes, golfers to any of the three courses in town. While the jobless rate isn't teeny, it's two percentage points below the national average. And opportunities nearby are growing: ATM builder NCR and construction equipment maker Sany plan to add a total of 1,400 positions in the next two years. Become a Facebook fan of Peachtree City!